Kinghorn residents are vowing that this won’t be the final chapter in Kinghorn library’s history after mounting a campaign to save it from closure. Led by local councillor George Kay, the high awareness campaign aims to gain the support of the people of the town to challenge the proposal by Fife Cultural Trust to close the facility as part of an £800,000 money saving package. The Trust, which manages and operates libraries on behalf of Fife Council, wants to move to a ‘hub and spoke’ model for the network. The move would reduce the number of libraries across Fife. Bowhill, Kinghorn, Thornton and East Wemyss are among those earmarked for closure, while others would operate reduced hours services. The management fee paid to Fife Cultural Trust is being reduced as part of the council’s efforts to tackle the much-publicised £77m budget gap. But the issue of closures has sparked a backlash in communities. On Monday Kinghorn took its campaign to the Highland Games day in neighbouring Burntisland. And campaigners will continue with activities on Kinghorn’s High Streeet this Saturday and at a public meeting in the town’s church hall on Thursday, July 30. Cllr Kay said he and Kinghorn’s other elected members learned about the proposed closure of Kinghorn and 15 other libraries in Fife, in The Press. “The opposition group on Fife Council forced the administration executive to at least consult on this. 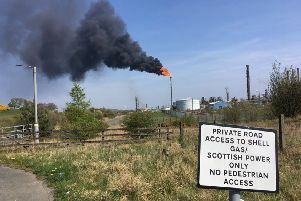 Describing the whole process as “atrocious,” he added: “This has been a sorry exercise in letting the people of Fife have any meaningful input to this deporable decision. “Questions asked by myself have shown that Kinghorn uses less than £20,000 a year to provide what should be seen as a necessity of life. The library is not just about books, but about jobs, about social interaction and about a healthy barometer of the life of the Kinghorn community. “Kinghorn library is not a failing asset but one that is growing year on year - and one that will continue to grow as we see development elsewhere in the town.